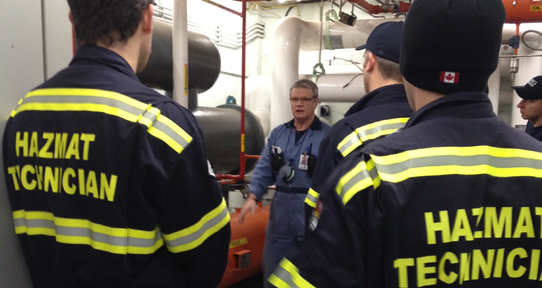 Capital Regional District HazMat technicians work with UVic staff during an exercise. There are chemicals, biological materials, compressed gases and other hazardous materials in several buildings on campus. In the event of a spill or release, there are important procedures to follow in order to protect yourself and others. Many buildings on campus are fitted with gas lines. In the unlikely event of a rupture or gas leak, evacuation may be required. Evacuation procedures during a gas leak are different from those during a fire, so it is important to familiarize yourself with the procedures before a leak occurs. Call Campus Security at 250-721-7599. Assist in building evacuation, communicating by word-of-mouth how to exit in order to avoid the gas leak. Once outside, move to a safe (upwind) location and do not re-enter until directed to do so by emergency personnel.